Can you maintain the grass close to your fence without damaging it? One common landscaping task you’ll often see happening in late spring and early summer is mowing the lawn. Whether your neighbors have riding mowers or use push models to mow their lawn, one thing you might see that they both do is that they carefully avoid the edges of their fence. So can you maintain the grass close to your fence without damaging it? No matter what your fence is made of, chances are it will need to be mounted on posts to make sure that it stands up straight. You can have in-ground fences or above ground fences. If you don’t want to damage the bottom edge of your fence, then you need to install an above ground fence. An in-ground fence might be a better choice for your pool. Once you have an above ground fence, you can guide trimmers and mowers underneath the fence in the gap between the barrier and the ground. 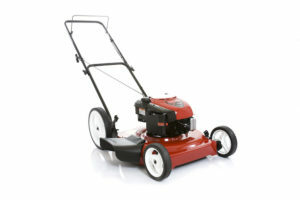 Our next piece of advice has to do with your lawnmower. Makes sure that the blades on it aren’t too high. Ideally, the blades should be set to 2 or 3 inches. Dry conditions might have dried out your grass, and wet ones might have caused your grass to grow out of the control. Consider the weather and plan accordingly – you might have to adjust your mower to avoid hitting your fence and leaving some nasty-looking marks on it. No matter how hard you there are going to be some areas in your yard that your lawnmower can’t touch. It’s one thing to guide the push mower into the space under the patio, but what if you run up against your garden fence? In this case, you might need to use a weed whacker to control grass length and get rid of any lingering weeds that you don’t want to pull up out of the ground on your own. However, you still need to be careful so you don’t scratch your fence. This entry was posted on Friday, June 8th, 2018 at 5:27 pm. Both comments and pings are currently closed.